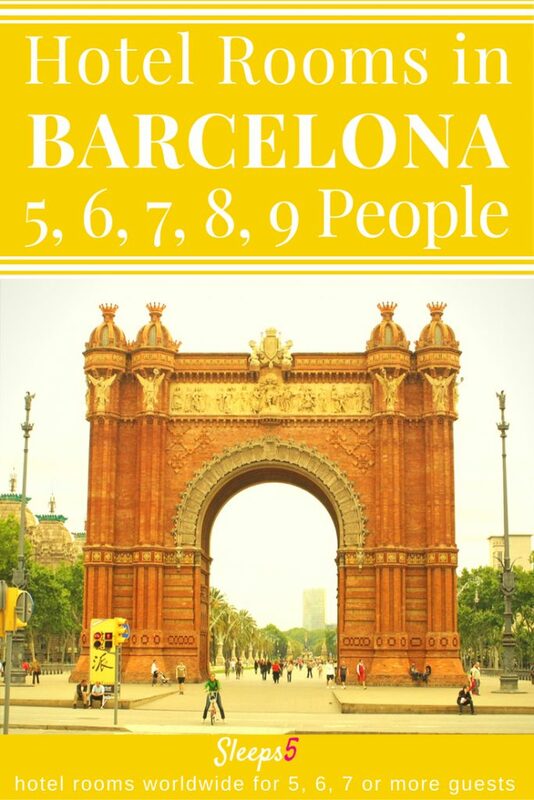 Barcelona, Catalonia, Spain hotels that can accommodate 5 or 6 people in one family room or suite, and aparthotels (apartments that operate like hotels) for 5, 6, 7, 8, or 9 people are listed in alphabetical order below (scroll down). The price / rate range of each hotel is indicated. See the $-symbol key in the sidebar. Click on the hotel name for more details and contact information. Larger hotel rooms, apartments, and suites are included, for budgets from affordable to luxury. All have private bathrooms (ensuite). Barcelona is the capital of the autonomous region of Catalonia in the country of Spain. Visitors may be surprised to learn that Catalan along with Spanish are widely spoken languages in the region. Check out the Omniglot for some useful Catalonian phrases.